Traditional skateboards are little more than a few wheels attached to a piece of wood, and that’s probably part of the reason for their overwhelming popularity. But what about when you need to save your leg power for surfing or rock climbing or whatever other extreme sport you’re going to be doing once you get to where you’re going? Fiik Skateboards has a line of powered skateboards that will not only get you there without depleting your precious leg power; they’ll also make you look like a total badass on the way. 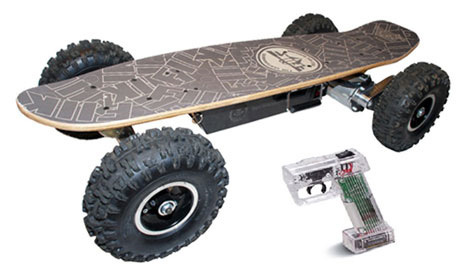 The Big Daddy model features huge tires that can easily take you off-road and a 800-watt lithium battery that will take you a little over 18 miles on a single charge. The top speed for this monster is about 23 MPH, which would probably be a little terrifying when there’s nothing between you and the pavement. You can take a little comfort in the fact that the board also features ABS brakes. But one of the most interesting points of the Big Daddy’s design is that you control it with a hand-held remote control – just make sure it doesn’t fall into the wrong hands or you could find yourself being taken on a truly wild ride. See more in Mods & Custom or under Transportation. March, 2011.